April’s two biggest box office successes will be available in 4K HDR quality for Smart TVs. The 1995 classic Jumanji is reimagined in Jumanji: Welcome to the Jungle, starring Jack Black and Dwayne Johnson (a.k.a. “The Rock”). The film follows four teenagers who discover a mysterious old video game, and are transported into the game’s jungle setting, where they must survive as the adult avatars they choose. Bringing more adventures to your home with a true cinematic 4K HDR experience is Star Wars: The Last Jedi, in which the galaxy faces a new threat from the First Order. Meanwhile, Rey (Daisy Ridley) must take control of her destiny, and Luke (Mark Hamill) reassesses his life as a Jedi. 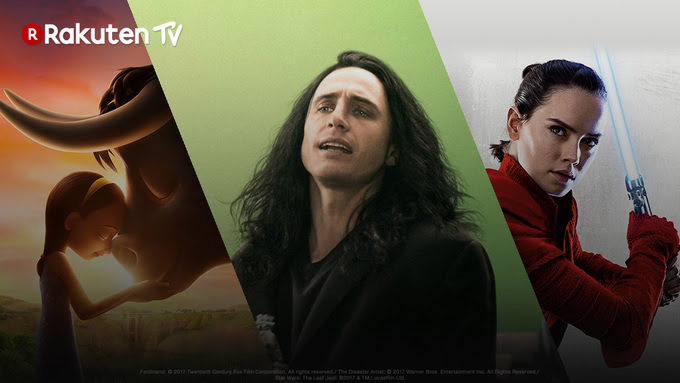 With the film awards season having just come to a close, it provides the perfect opportunity to watch some of this year’s best films and highlight which will be featured on your own Rakuten TV screens. The Greatest Showman, directed by Michael Gracey, is an original musical that celebrates the birth of showbusiness and was awarded as Best Original Song at the Golden Globes which will now be available on Rakuten TV. It will also have the multi award-nominated Molly’s Game starring Jessica Chastain, the true story of Molly Bloom, an Olympic-class skier who ran the world's most exclusive high-stakes poker game before being investigated by the FBI.